As of the publication of The Story of John Winthrop 1st Gov of MA in 1891, this birth date (Jan 12 1587) was expressed in modern calendar dates as January 22, 1588. The funeral was delayed till John could come from Connecticut. It was to be so ordered - as said the summons, dated "your father's parlor," despatched by fleet-footed Indian messenger, the ever troublesome Bellingham its first signer-" that it may appeare of what precious account & desert he hath ben, & how blessed his memoriall." It took place April 3, being conducted " with great solemnity and honour," both civic and military. The place of interment was what is now called the King's Chapel Burying-ground, - the spot to be seen at this day. John and Mary were married by Ezekiel Culverwell. So, exactly, reads his birth-record, ? a smiling one, plainly,?as his father set it down in his private diary a little more than three hundred years ago. The date is expressed after the rule of the Old Style ; now it would be Jan. 22, 1588. 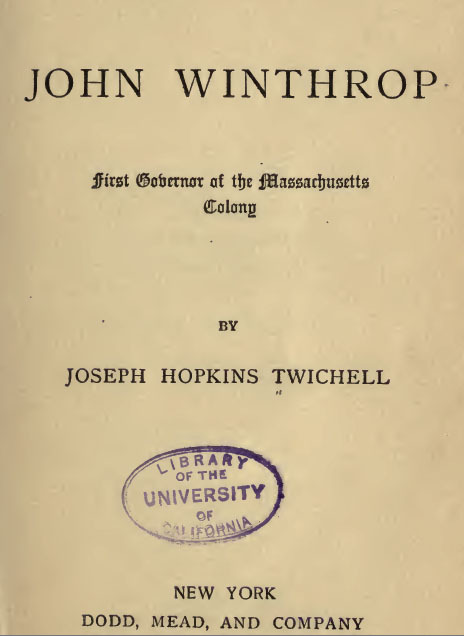 [S18803] John Winthrop First Governor of the Massachusetts Colony, 231. But the governor's hour was come. He fell asleep, "in the great consolations of God," March 26, 1649, in his sixty-second year. The funeral was delayed till John could come from Connecticut. It was to be so ordered - as said the summons, dated "your father's parlor," despatched by fleet-footed Indian messenger, the ever troublesome Bellingham its first signer-" that iay appeare of what precious account & desert he hath ben, & how blessed his memoriall." It took place April 3, being conducted " with great solemnity and honour," both civic and military. The place of interment was what is now called the King's Chapel Burying-ground, - the spot to be seen at this day.